Most of us have been harvesting our summer sweet potatoes since November. 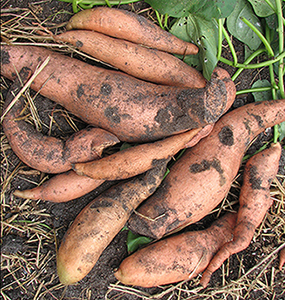 Here in South Florida sweet potatoes function like perennial plants. While a frost and freeze will damage sweet potato vines our soil doesn’t freeze. The parts below ground do fine all winter long so that once you have sweet potatoes you will always have them. It is only necessary to create your slips once. 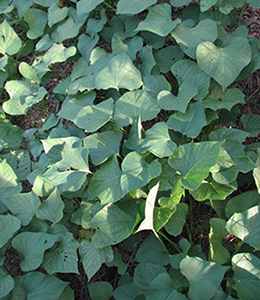 After that there should always be sweet potato vines somewhere in the garden from which to take new cuttings. I have even discovered that discarded vines can not be trusted to die and decompose, rather, they grow where ever they are thrown down. If you are a no till gardener like I am you understand when I say it gives me pain to dig up sweet potatoes, so when I harvest them from my winter garden I take the vines out as well as potatoes that are obvious from the surface. I don’t turn up all of the soil where the potatoes grew, and that has worked well for me. Then in the spring, as my winter crops are finishing, the parts that were left below sprout again just in time to cover the soil for the summer. This year I have kale and cabbage transplants growing in the bed from which I took the sweet potatoes. While we had some very cold weather in October, we have otherwise had a mild/warm winter (It is the beginning of January now, so we may yet have cold weather.). Usually sweet potatoes will lie dormant below my winter garden only surging in the spring as the temperatures rise. Not so this year, even as the cabbages and kale are taking hold I am finding sweet potato sprouts coming up through the mulch between them. I have been able to push my fingers into the soil around the potato sprouts, and slide long slim potatoes out of the ground without disturbing the young transplants on the surface. I have, so far in this way, harvested many lovely sweet potatoes from the garden this winter. In one case, as I began to push my fingers in to grasp the potato below, a very large earthworm ejected itself from the soil. I have to admit I was startled. It was a very big earthworm, night crawler size, and it actually launched itself out of the ground, and then quickly found its way back down into the soil where it landed, which brings me to another point about sweet potatoes. Knowing what I know now about sweet potatoes preference for sandy drier soils I have often said I would not again put sweet potatoes in my better soils, but every spring like clock work the sweet potatoes re-sprout in this garden section where I originally put them, and I find that I like the effect they have there as much as I enjoy the food they produce. Finally, South Floridians, put your sweet potatoes in the refrigerator. The cool temperatures increase the sweetness of your crops, and will inhibit sprouting. However, you didn’t mention how tasty those fresh young leaves can be! I prefer sweat potato leaves to spinach, the young ones fresh, and the older leaves cooked just like spinach or other greens. I don’t mind that much though, as I get the leave second hand, in the form of free range eggs. I love the focus on sweet potatoes. I recently harvested my orange and purple sweet potatoes. They take almost no work. I really enjoy growing sweet potatoes – especially the purple fleshed sweet potatoes. The color is so fun. However, I think they need to be developed a bit to make their production and quality equal that of the best orange varieties.